Real Time and Archived Satellite Imagery Click here some tips on interpreting these images (clouds & navigation). There are currently 3 different Ocean Color products posted on this website from 2 different satellite sensors. The first of which is Chlorophyll concentration calculated from Ocean Color Monitor (OCM) data collected via India's Oceansat satellite. This data is the highest resolution satellite measured chlorophyll data available and is at a 360m resolution. The chlorophyll algorithm used is based on the SeaWiFS OC4 algorithm. 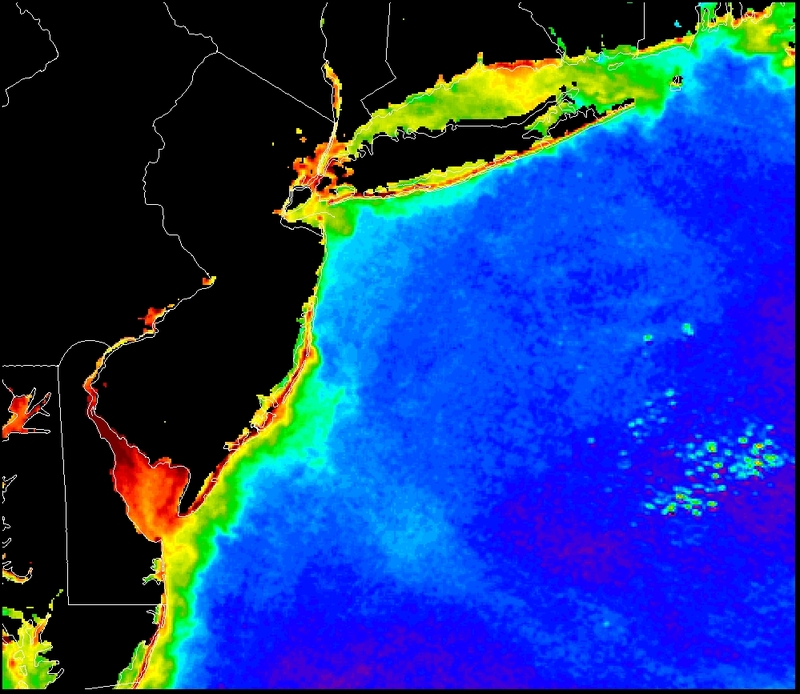 The second product is Chlorophyll concentration calculated from the MODIS data collected via the US Aqua satellite. These imagery are at a resolution of 1km. The third product we call "ocean color". These images are created using data collected by China's FY1-D satellite. We record approximately 2 of these passes per day with our L-Band satellite dish. The FY1-D satellite has 10 channels in the visible and infrared spectrum and provides us with 1km resolution data. The product generated is what we call "relative chlorophyll concentration". The Chinese space agency has yet to release the calibration data for this satellite, therefore it is not possible for us to compute actual chlorophyll concentration values. We can, however, through a simple ratio of blue and green channels, compute a very rough, relative estimate of chlorophyll that allows us to see spatial patterns. Red areas are indicative of murky green water, while blue areas represent clearer, bluer water. The raw satellite data is processed to our "relative chlorophyll" product by ratioing channel 9:channel 7 (green:blue) with SeaSpace Terascan software. Our data is stored in an HDF file format and is plotted using Matlab. The US coastline (drawn in black) is taken from the NOAA Coastline Extractor database (World Vector Shoreline 1:250,000). Bathymetry (also drawn in black) is obtained from the Smith and Sandwell Bathymetric dataset and units are in feet. Most images have the edge of the continental shelf (600 feet or 100 fathoms or ~200 meters) drawn.